The earliest written reference to Kew is thought to be contained in Julius Caesar's Gallic Wars, as the location where the Roman Army forded the Thames in 54 BC. The name Kew is a combination of two words: the Old French kai (landing place; "quay" derives from this) and Old English hoh (spur of land). The land spur is the bend in the Thames. The name was recorded in 1327 as Cayho. There have been at least three palaces built there. Of the first not much is known. Queen Elizabeth I gave it to Robert Dudley, her childhood friend and court favourite. A letter from another of Elizabeth's courtiers suggests this to have been Dudley's main home near London; it may also have been called Leicester House. The so-called 'Old Palace', sometimes referred to as the Dutch House, was built in 1631 by Samuel Fortrey, the father of author Samuel Fortrey. The building formerly belonged to the Smith family, and by marriage became the property of Samuel Molyneux, Esq., secretary to George II. Frederick, Prince of Wales took a long lease of the house, which he made his frequent residence; and here, too, occasionally resided his favourite poet, James Thomson, author of The Seasons. In 1738, another poet, Alexander Pope, gave Prince Frederick a dog, with the following verse inscribed on its collar: I am His Highness' dog at Kew. Pray tell me, sir, whose dog are you? The building was taken on a long lease by George III from the descendants of Sir Richard Levett, a powerful merchant and the former Lord Mayor of the City of London, who had purchased it from the grandson of Samuel Fortrey. 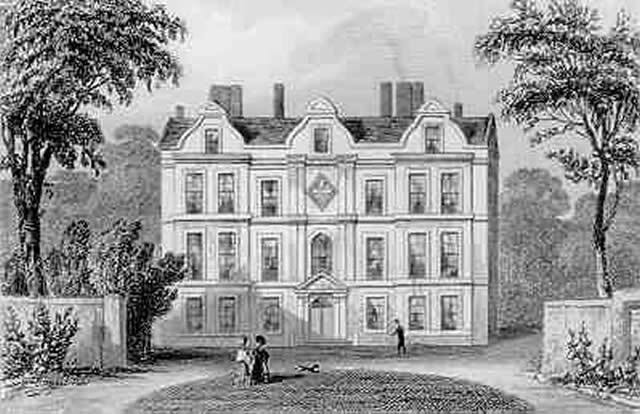 George III's residency of the Dutch House was originally intended to be brief, a temporary residence while his new castellated palace in the Gothic style (described below) was built - at first the Royal Family resided at Richmond Lodge but as the family became larger it became necessary to take over other properties on Kew Green, which included the Dutch House. George III's wife, Queen Charlotte died at the Dutch House on 17 November 1818. On ascending the throne in 1837 Queen Victoria gave most of Kew Gardens to the nation, retaining for her own use only a small summer house once belonging to Queen Charlotte. This third structure was designed in part by King George III, and otherwise by James Wyatt. The new palace was intended to be "a late Georgian Nonsuch". Commenced in 1802, it was a gothic "castellated palace" which attracted little praise, being considered too silly for a patron of his standing. The new palace's style was not to the taste of his successor the profligate George, the Prince Regent. In 1828 Parliament, having studied the accounts, ordered the shell to be demolished, and such fixtures and fittings as had been installed to be used elsewhere in royal residences. The staircase was later used at Buckingham Palace. Sir Richard Phillips (1767–1840), in "A Morning's Walk from London to Kew," (1817) characterised the new palace as "the Bastile palace, from its resemblance to that building, so obnoxious to freedom and freemen. On a former occasion," says he, "I have viewed its interior, and I am at a loss to conceive the motive for preferring an external form, which rendered it impracticable to construct within it more than a series of large closets, boudoirs, and rooms like oratories." The "Dutch House" is a renowned example of the so-called Artisan Mannerist style of brick-building, reflecting the incorporation in a "free" manner of features of Classical architecture adapted to the qualities and contraints of brick as a material. 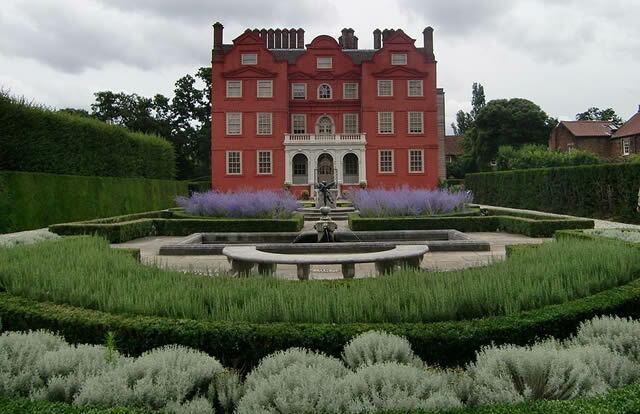 It is located in Kew Gardens and despite its name it is the size of a manor house. Kew Palace was used to hold a dinner hosted by Charles, Prince of Wales to celebrate the 80th birthday of Queen Elizabeth II on 21 April 2006. A few days later it reopened as a visitor attraction, following a ten-year closure for restoration. The restoration not only included physical restoration to the building, but also weaving of period draperies and other fabric décor carried out by master weaver Ian Dale of Scotland. An external lift shaft was added on the west wing for disabled access, in the place of a tower which housed three floors of lavatories. Kew Palace, Queen Charlotte's Cottage and the Royal Kitchens are incorporated in the admission to Kew Gardens. There is a toilet at the nearby Welcome Centre. Manual wheelchairs are available for use within the palace. Chairs are provided on a first come, first served basis. There is limited disabled parking on Kew Green near the main gate and at Brentford Gate car park. Electric wheelchairs may be pre booked on a first come first served basis through Kew Gardens.Assistance dogs are allowed. Transport: Kew Gardens (Overground). Kew Bridge (National Rail). Kew Pier (Thames River Boats - summer only). London Buses routes 65, 237, 267 (summer Sundays only) and 391 stop nearby. Opening Times: Daily 10:30 to 17:30. Opens on the 23rd March.